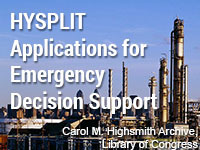 The second edition has been updated to reflect the addition of the ALOHA source strength term and CAMEO chemicals database to the HYSPLIT dispersion model. This addition requires forecasters to ask different questions of emergency responders, input different parameters into the dispersion model, and interpret and disseminate different output graphics. This is on the job training for me, as well as education. Describe the options entering the meteorology in NWS HYSPLIT/ALOHA and CAMEO/ALOHA. List several issues with NWP model forecasts that may impact the dispersion model simulation. List the different release types in ALOHA Source Strength determination (tank, puddle, gas pipeline, direct).